Deep beneath San Francisco’s Civic Center Plaza, in a windowless bunker called Brooks Hall, a 40-ton pipe organ gathers dust. 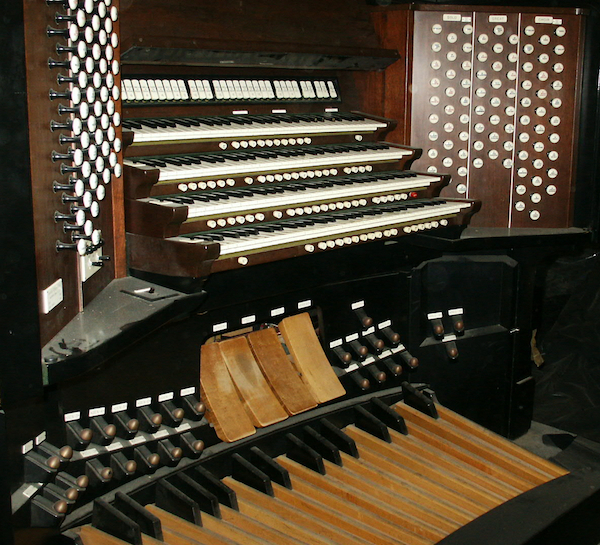 Known variously as the Exposition Organ and Opus 500, the century-old instrument was a mechanical and musical wonder when it was unveiled in 1915, the seventh-largest organ in the world. 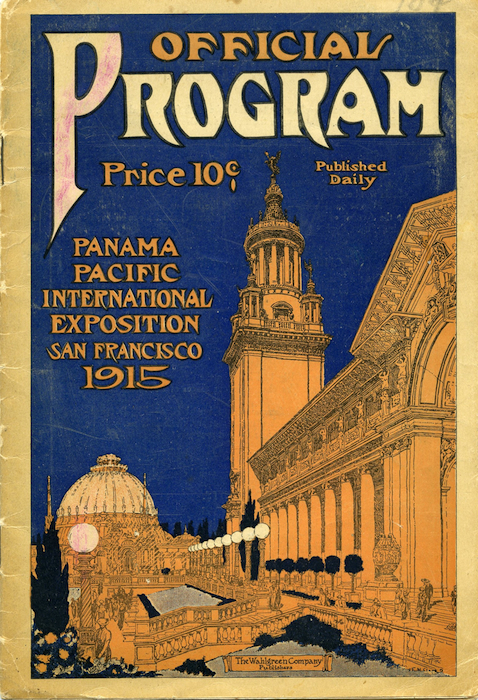 Back then, thousands of people a day attending the Panama-Pacific International Exposition applauded its soaring crescendos and rib-rattling swells. Today, the organ’s 7,500 pipes and countless other parts sit silent and in pieces, packed into boxes and crates spread across 3,600 square feet of concrete, basement floor—in some places, the crates are stacked 12 feet high. To prepare a new site for the instrument, move it, put the thing back together again, and then tune it could cost upwards of $2 million, assuming, of course, you could find a home for the finished instrument. So far, no one has. That may be about to change. Although details are still under wraps, members of a group known as the Friends of the Exposition Organ have told us that after years of looking, they may have finally found a new home for Opus 500. Above: In 1915, the great Edwin H. Lemare (seen at right) played the Exposition Organ to packed houses in Festival Hall. 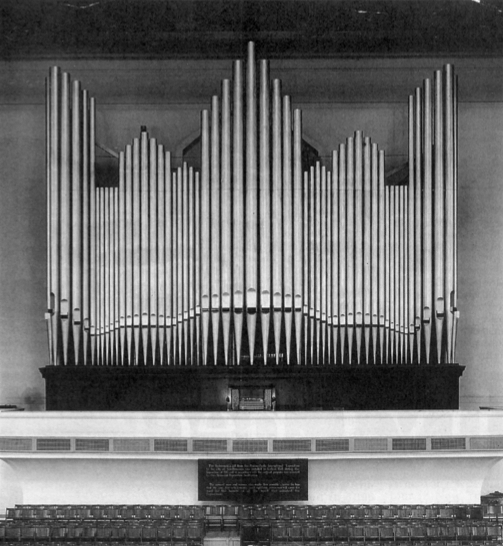 Top: Lemare beneath the organ’s display pipes, the longest of which is 32 feet. Built expressly for the Panama-Pacific, which ran from February to December of 1915, the organ was first housed in Festival Hall, a domed, 3,782-seat, Beaux Arts pile of plaster and burlap that filled and emptied twice a day with enthusiastic crowds eager to hear the great English organ virtuoso, Edwin H. Lemare, work his magic behind the organ’s state-of-the-art console. At the close of the Exposition, when most of the temporary structures built for the world’s fair were destroyed, the instrument was moved to the city’s new Exposition Auditorium, which was built across town near City Hall and paid for with surplus funds from the Exposition. Shortly after its construction, the building was renamed Civic Auditorium and is now known as Bill Graham Civic Auditorium. Like Festival Hall, the city’s new Civic Auditorium was designed for Opus 500, which remains the largest, most important non-structural artifact from the Exposition. The first performance in its new home was held on Easter Sunday, 1917, with Lemare again manning the keys, pedals, and stops. 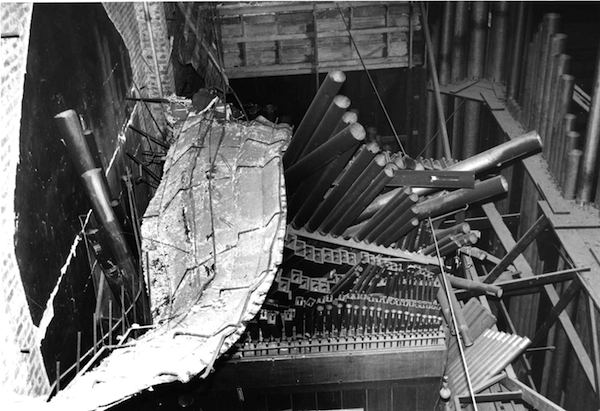 The last sound the organ made occurred sometime before October 17, 1989, when the Loma Prieta earthquake sent a wall of plaster crashing down on its pipes, baffles, and air box, all of which, by a cruel trick of fate, had only recently been restored. Loma Prieta set neighborhoods on fire, flattened an elevated freeway, and shook a hole in the Bay Bridge, which is why repairing the damage to the Exposition Organ was not exactly at the top of anyone’s to-do list. In fact, it took almost five years for city officials to decide the fate of the wounded behemoth slumbering in the crippled auditorium. Finally, in mid-1994, FEMA funds in hand, all but the organ’s largest pipes and its pair of 20-horsepower blowers (each about the size of a VW Beetle) were trucked to the Austin Organ Company’s Connecticut headquarters, where the instrument had been built almost 100 years before. Lemare gave 121 concerts at the Panama Pacific International Exposition, bringing in $5,000 more than his $10,000 fee for the event’s organizers. Photo: The Seligman Family Foundation. Repairs were well under way when, in January of 1995, completely out of the blue, the city of San Francisco’s contractor halted work on the organ, claiming the $1,293,747 in federal monies earmarked expressly for the organ’s repair were now required for asbestos abatement back at the Civic Auditorium, which, by the way, was being remodeled as if the organ would never be returned to its rightful home. Organ supporters cried foul, and a good deal of finger pointing ensued until a compromise was struck to finish the work already in progress back at Austin, but nothing more. After Austin finished its interrupted work, the organ’s pieces were trucked back to San Francisco and unloaded into Brooks Hall, where Opus 500 has languished for almost two decades. In the end, the contractor was able to divert $450,000 in FEMA funds designated specifically for the organ’s repair to other purposes. In retrospect, this diversion of FEMA funds may have been illegal, but it’s way too late to do anything about that now. Today, about 85 percent of the organ is ready for assembly. 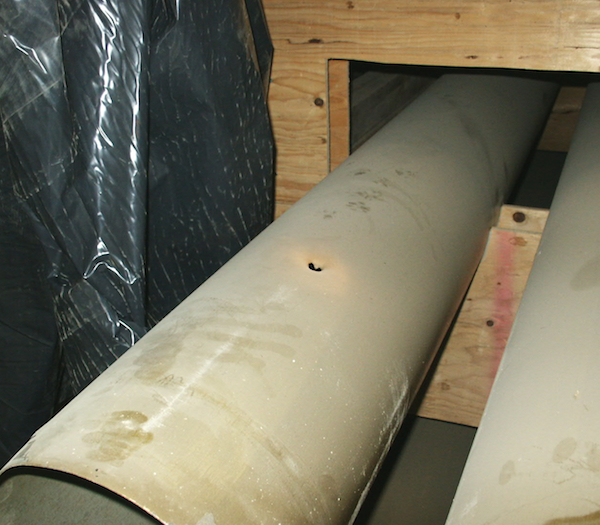 Many of its smaller pipes, some as delicate as penny whistles, are still packed in the boxes the Austin Organ Company shipped back to San Francisco in 1995. 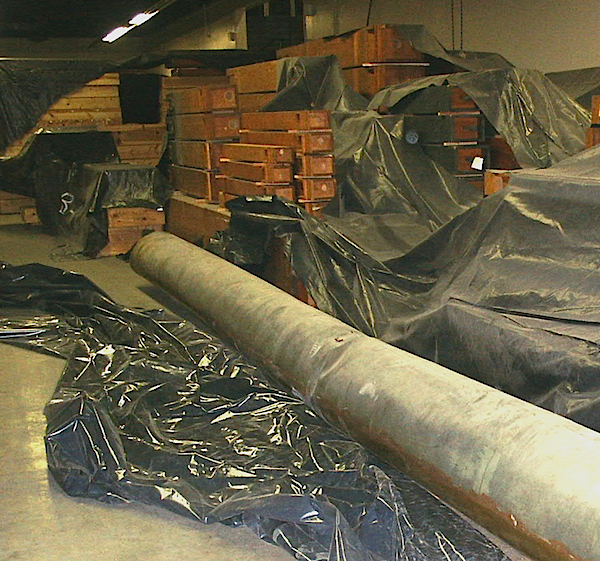 The larger façade pipes that never made the trip to Connecticut rest on specially designed cradles, while the organ’s longest pipe (32 feet) lays directly on Brooks Hall’s unforgiving concrete floor, the weight of the rolled-zinc pipe’s 600 pounds deforming its tube shape into a bloated oval, resembling a giant, dusty tapeworm rather than an instrument meant to deliver heavenly sounds to the ears of God. Despite its hard-to-hide size and well-documented history, most San Franciscans have no idea this gargantuan beast sleeps in their midst. Indeed, some of its keenest supporters spent most of their lives in San Francisco clueless to the instrument’s presence. One such supporter is Michael Evje, a classically trained pianist, who along with Vic Ferrer and a former church organist named Justin Kielty comprise the Friends of the Exposition Organ. A postcard of Festival Hall, which was demolished after the Exposition. Filmmaker Vic Ferrer got involved with the Exposition Organ in 1997, when a group of organ enthusiasts were trying to drum up support for a plan to relocate the instrument from its purgatory in Brooks Hall to a new home they were calling the Embarcadero Music Concourse and Organ Pavilion, which was slated to be built near the Ferry Building on the San Francisco waterfront. At the close of the Panama Pacific International Exposition, the organ was moved to San Francisco’s Civic Auditorium, which was built to accommodate its 46-by-20-foot dimensions. Lemare (in the circle at left) performing to a packed house in Civic Auditorium. 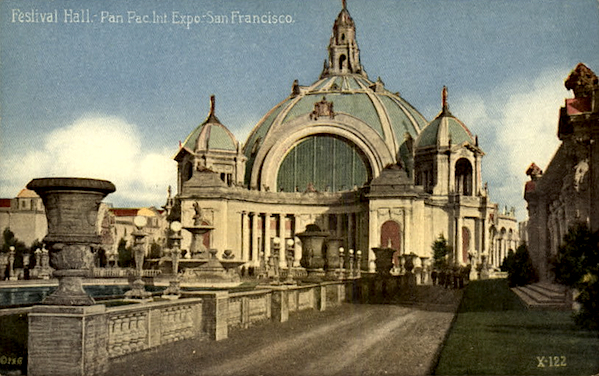 As a young man, Schoenstein had helped his family’s business, Felix F. Schoenstein & Sons, install Opus 500 at both the Panama-Pacific International Exposition and the Civic Auditorium. Given his long history with the instrument, Schoenstein personally oversaw the care and maintenance of the organ for the city of San Francisco, including keeping its secrets from the prying eyes of smart-aleck high-school kids. As Kielty remembers it, though, Schoenstein also had a forgiving side, which he revealed later that same day by giving the inquisitive teenager a behind-the-scenes tour of the organ’s air box while the blowers were on. The 1989 Loma Prieta earthquake sent a wall of the Civic Auditorium crashing down on its pipes, baffles, and air box, all of which, by a cruel trick of fate, had only recently been restored. Photo: Charles Swisher. Today, that chamber is in pieces, waiting to be reassembled and filled with the air that, at the organist’s command, is forced through more than 100 ranks, or groups, of the instrument’s 7,500 pipes. Despite all these pieces, the Exposition organ is a relatively simple machine. There’s the console with its keys, pedals, and stops, a pair of blowers, the air box, and a whole lot of pipes. The organist sits at the console, which in the case of Opus 500 has four manuals or keyboards (each similar to a piano’s keyboard, but with 61 keys instead of 88) and a pedalboard, whose 32 notes are played with the feet. There are also more than 100 stops, which open up groups of pipes of various pitch when pulled (the manuals dictate the actual notes). While the pedal keyboard generally plays the lower base notes and the manual keyboards the higher registers, together the organ’s pitch-range exceeds that of any other instrument, or even most collections of instruments. Regardless of their size, all pipes stand on top of the air box, which is pressurized by two 20-horsepower blowers. When the organist depresses a key or foot pedal, valves called pallets open at the base of the pipes associated with that note, letting the air in the chamber rush through any of the pipes that have previously been made accessible to airflow when the organist pulled open a stop. The console for Opus 500 is designed to send its signals to the pallets electronically, which is why there are more than 100 miles of wire running through the instrument. The greatest organist ever to sit behind Opus 500’s console was Edwin Lemare, who performed 121 concerts on the organ when it was housed in Festival Hall in 1915. He was paid a then-staggering $10,000 to play the instrument, whose keys and stops were faced with ivory. Lemare’s tenure began inauspiciously. In fact, according to historian Nelson Barden, it almost didn’t begin at all. In February of 1915, when the Exposition opened, Europe was at war, and the waters around England where Lemare lived had been declared an exclusion zone by Germany. Complicating matters, Lemare’s third wife, Charlotte, was expecting her second child. But Lemare was determined to get to San Francisco, lest his lucrative contract for 100 performances, which were supposed to begin in June, was cancelled. Thus, the family booked passage on the Lusitania, due to leave Liverpool on May 11 after it had steamed across the Atlantic from New York. 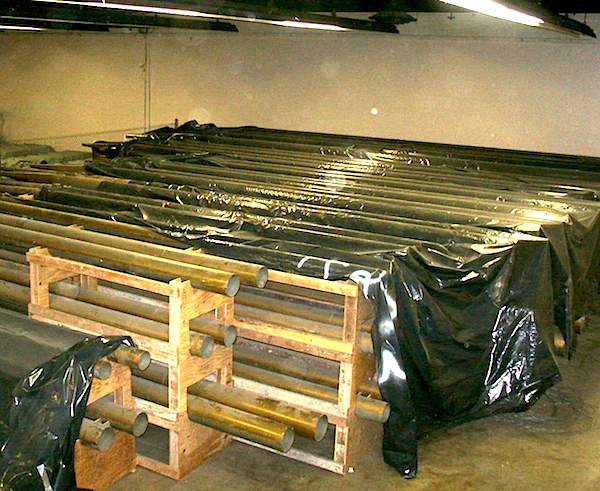 All 40 tons of the Exposition Organ, including its zinc pipes, are currently in storage in Brooks Hall, which is hidden beneath Civic Center Plaza. As any school kid who has studied World War I history knows, the ship never made it to England, sunk by a German torpedo, killing almost 1,200 passengers and crew. Crossing the Atlantic was now deemed a hazardous trip, but somehow, despite the tragedy of the Lusitania and the hostilities raging around him, Lemare managed to get a ship on August 4. A month later, his family, including his newborn daughter, secured berths on the last passenger steamship to leave Liverpool until the war’s end in 1918. Against this emotional backdrop, it must have been a serious disappointment to Lemare when only 400 people showed up for his first recital on August 25, 1915. But that would be one of his few concerts not to sell out at 10 cents a ticket, a premium over and above the 50-cent admission to the Exposition itself. By the end of the Exposition, more than 150,000 people had paid their dimes to hear Lemare, which means he raised $5,000 more than his salary for Expo organizers. 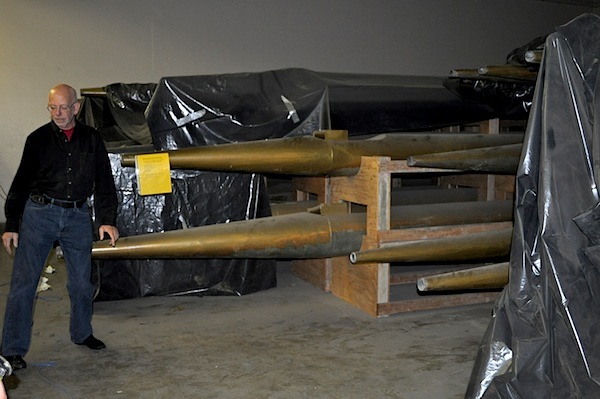 Michael Evje standing at the tapered feet of the organ’s display pipes. 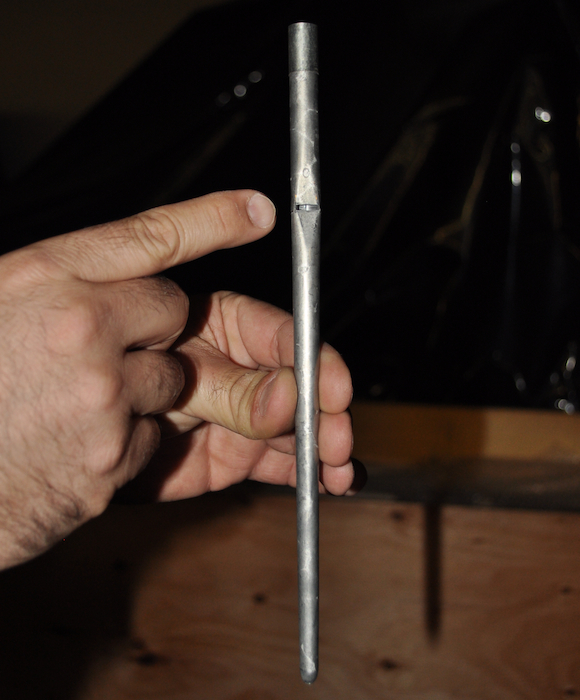 Air from two 20 horsepower blowers enters all of the organ’s 7,500 pipes through these smaller ends. Lemare returned to San Francisco in 1925 to play a sold-out engagement at the Civic Auditorium, but by then, organ recitals had largely fallen out of favor. The sonorous sounds produced by pipe organs seemed tired and treacly compared to the fun, fast-paced rhythms and toe-tapping beats of 1920s jazz, which was widely promoted in clubs and on a recent invention, the radio. 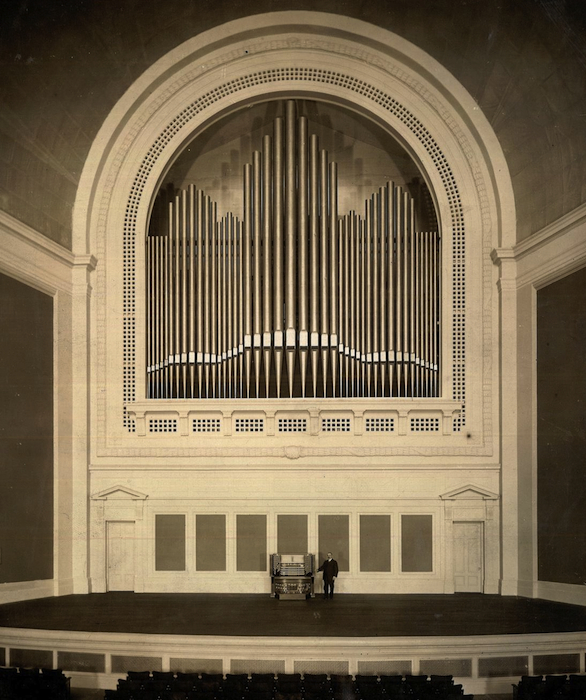 In the decades that followed, the Exposition Organ in the city’s Civic Auditorium would be played less and less, a quaint albatross from a bygone era. In some respects, the instrument was already in storage, except that its parts were fully assembled and it was housed in a room designed to bring out its best. But in 1962, even that benefit was eliminated when an ill-conceived remodel of the hall sucked the life out of the organ’s acoustics. Those who heard it before 1962 and afterwards swear the instrument never sounded the same. Also in storage in the organ’s console, which replaced the original in 1963. It features four manuals or keyboards. Edward Millington Stout III, considered the dean of the San Francisco organ scene, is one of those people who heard Opus 500 before and after the remodel. Stout knows how to get the most out of everything from modest movie-theater Wurlitzers to classical organs like the one at San Francisco’s Grace Cathedral, where he served for 42 years as the institution’s organ curator. For Stout, the reason for Opus 500’s auditory decline after the Civic’s disastrous facelift in 1962 is hardly mysterious. When the stops on Opus 500 are opened by pulling them out, air is allowed to flow through ranks, or groups, of pipes, which give the notes played by the organist different tones. For supporters of the Exposition Organ, saving this irreplaceable piece of the city’s heritage is an opportunity to right a wrong, as well as to avoid painful mistakes that lost the city landmarks such as the incomparable Fox Theatre, which was unceremoniously leveled in 1963 to make way for the joyless, 29-story nightmare of an office building that replaced it (silver lining: the Fox’s 4,000-pipe Wurlitzer was saved, and is now housed in Hollywood’s El Capitan Theatre). The organ’s largest façade pipe is 32 feet long. Its storage on the floor of Brooks Hall has done more damage to it than the earthquake. In the background are many of the organ’s wooden pipes. Bethards admires Opus 500 for multiple reasons. “First of all, it is a solid, well-designed, beautifully voiced musical instrument. It’s not just a big curiosity. In addition, the Austin organ is a fantastically brilliant bit of technology and invention. It’s efficient to maintain, efficient to build, efficient to install. It’s really a wonder of the industrial age, a marvel of engineering. There’s no concert organ of its type anywhere in California, or even in the West,” he adds. 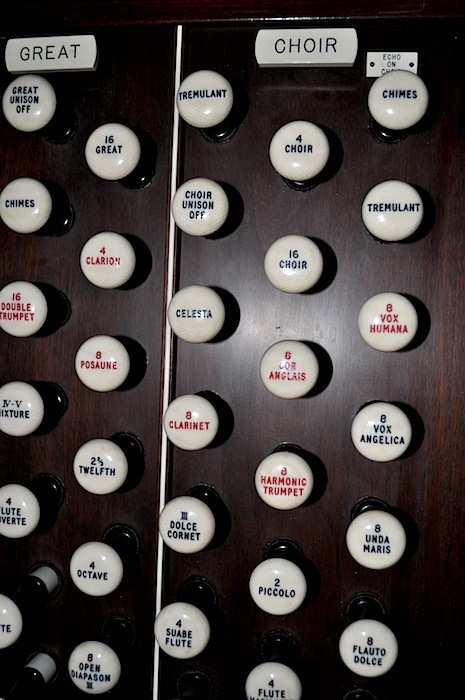 In fact, a quick scan of the organ’s stops, which are the knobs the organist pulls out to open ranks of pipes, reveals the orchestral roots of the instrument. On Opus 500, there are stops labeled Flute and Piccolo, others designating all sorts of flavors of Tuba, Trumpet, and Trombone. The Vox Humana stop produces choirs and choruses, while pulling out Voix Celeste summons strings. One pipe sports a bullet hole from its years in Civic Auditorium, but no one knows who pulled the trigger or why. When the ceiling in the Civic Auditorium was lowered, the acoustic influence was largely negative, which may have been one of the unsaid justifications for kicking Opus 500 to the curb when it was sent back east for repair in 1994. After all, if the thing didn’t even sound like it was supposed to anymore, why bother to reinstall it? But that level of logic assumes that the powers that be actually cared about the Exposition Organ at all. More likely, someone just wanted the floor and wall space, unencumbered by an enormous pipe organ. 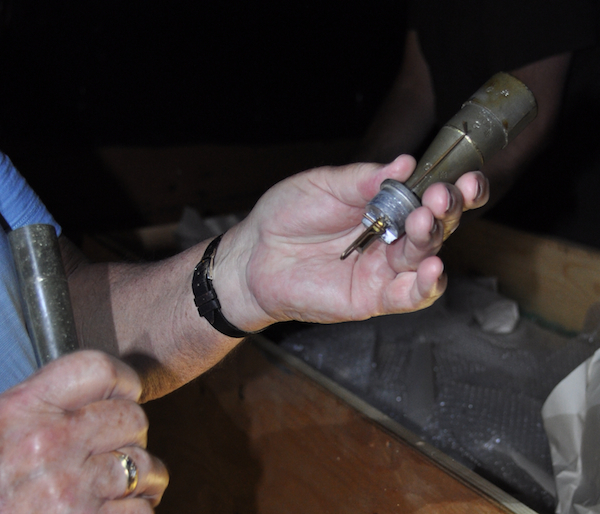 The hardware inside the pipes is as good today as it was almost 20 years ago when they were restored by the Austin Organ Company of Connecticut, which built the organ in 1915. One of the organ’s smallest pipes. Doing everything they can to make sure the Exposition Organ will be secure in its potential new home is critical because the Friends know the clock is ticking. On the most basic level, there’s a strong sense the instrument has worn out its welcome in Brooks Hall, and that the city would like to use the not-insignificant amount of floor space it consumes for other purposes. A number of wooden pipes, from the large gray one on the floor to smaller examples. Most are made of sugar pine. Time is also not their ally when it comes to the loss of continuity at Austin. “Imagine dismantling a pocket watch and putting it in a drawer for 20 years,” asks Hochhalter, “and then trying to reassemble it. I’ve talked to the guys at Austin, and they’re starting to forget what was done.” Sure, there was documentation, he says, but the erosion of the institutional memory at Austin will only make the remaining repairs that much more difficult, and costly. And then there’s 2015, the 100-year anniversary of the Panama-Pacific International Exposition, perhaps the most important deadline of all. When it comes to bringing history to life for people, a centenary can be a powerful catalyst, prompting press attention and the interest of donors. For the Friends of the Exposition Organ, 2015, now less than a year away, is perhaps their most persuasive call to action to would-be supporters. Seriously? I can’t believe anyone would really consider this a serious priority. I’m sure this pipe organ is a wonderful artifact, but it’s just that – an artifact from a past time, whose relevance is totally gone now. Guess what, nobody cares about this in San Francisco except organ lovers. There are many, many more important things to spend money on, and the city is right to push this to the side. As a native San Franciscan now in exile, and a musician who remembers hearing Opus 500 in the Civic Auditorium, I am thrilled to hear that a group is working toward bringing this historic instrument back to life. This organ should be honored and treasured as much as its contemporary, the Palace of Fine Arts. Sometimes the City has been cavalier about destroying its past (I’m thinking in particular of the Fox Theater), but I hope that in this case, as with the cable cars, important history will be preserved to delight future generations. Artifacts from the past are what retain our collective memory and appreciation of those who came before us and remind us of their contributions to our society, culture and history. Just ask any one of the thousands of folks on this site who post ‘Show and Tells’ of their “artifacts.” They will tell you that their treasures *DO HAVE RELEVANCE*. “Artifacts” teach, inspire and remind us of who we were while propelling us forward into the future. This pipe organ is a supreme example. What a cold and heartless world we would have without our history and artifacts. Practicality has its place of course, but not at the expense of our heritage. And what some might consider “junk” today may be treasured tomorrow. Yes, to this day San Franciscan’s regret loss of the Fox, all over a small amount of money that was needed to save it. Denver also regretted loss of the Tabor Grand Opera House, torn down I believe in 1958. It wasn’t five years later when everyone understood the loss to Colorado’s heritage. There was a plan to place this fine instrument in a Pavilion on the Embarcadero in the style of the San Diego Balboa Park Austin. Is that dead? Although modern technology such as I am using right now, is vastly improved over that of ten years ago let alone a 100 years ago, craftmanship is not only increasingly rare, but unfortunately in many fields, a dying or extinct art. Many modern examples which cannot match timeless flair, panache and quality of their predecessors. As is the case with the Opus 500. It is a slam dunk money used for its restoration will yield a priceless rate of return on this investment. To answer Mark Fownes: the Pavilion on the Embarcadero was part of a larger bond measure which voters turned down. Some of us believe that weather conditions as well as noise factors would have made the Embarcadero project a failure were it to have been built. The San Diego Balboa Park Austin enjoys beautiful weather in quiet surroundings. This organ actually has considerable relevance. Many of the nation’s premier music and performances venues are seeking/acquiring pipe organs, like Disney Hall in LA, The Kimmel center in philadelphia, and the Atlanta symphony center (if it will ever be executed). It is the opinion of many that a first class music venue is not complete without a fine pipe organ. These are prized and cherished objects, and these current trends certainly belie any irrelevance. This subject brings up so many feelings. A comments sections is so inadequate! 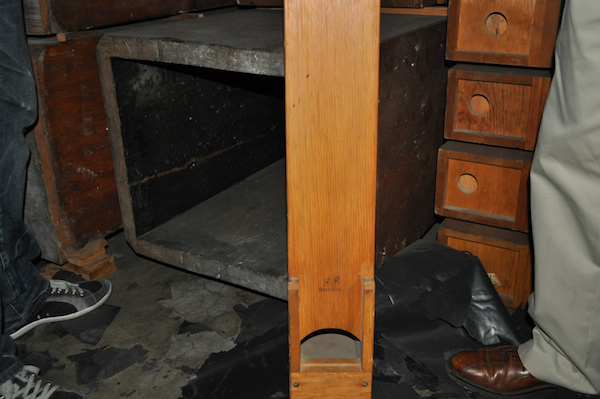 Housing an instrument like this in a warehouse is one discussion question. What else to do with it is another. One other large organ I know of was burned while waiting in warehouse storage. When is the right to move on it and how do you proceed? With all of these questions and many more, we could fill a three-day convocation! Bravo on the video, Vic! I am quite surprised at John’s notion of this organ as an irrelevant artifact. What are these “many, many more important things to spend the money on?” The past helps us remember who we are as humans and allows a perspective and enjoyment of art in many forms, which engenders further creativity for most everyone. Most certainly this instrument was and can be a thrill for anyone in the city and beyond. I have seen the loss of Frank Lloyd Wright buildings and of many other historical elements in our nation. This only diminishes our perspective of who we are as people and as well as a nation. The Fox Theater was a prime example of this type of thinking. I lived in San Francisco for a short two years, but took in the wonders of the city and all it had to offer culturally in every way. Yes, I am a musician who happens to play the organ. John is obviously poorly acquainted with the instrument and would likely change his mind were he to take the time to listen to what the city has to offer in its’ other venues with pipe organs. This instrument sounding again would only further enhance the cultural wonders of San Francisco. I’d love to see this instrument get restored. I know the person who has the original console, and know someone else who has helped restore the original console. America, not just San Francisco, is a place that throws away its past, often to regret it later. Americans then visit Europe for the richness of its history and culture, including its architecture, historical buildings, cathedrals, even pipe organs–all the things that comprise a deep cultural heritage, the things that define a people and give that people true lasting significance, so much more than the mere thinnest film of the latest technological development and social trend. I too am a musician, a fan of the pipe organ, but I applaud “us,” Americans, every time we save ~anything~ of merit from our past, and I support our doing so. I derive tremendous enjoyment from seeing old churches, fine old buildings, Colonial houses, old machinery, steam locomotives, outdated technology that once powered our country, even dilapidated farm buildings; not to mention art and craft from bygone eras. I had the pleasure to spend a night in a house built in 1870. It was an experience to simply be there in the presence of 140 years’ history. In my part of the country, we have nothing of that age, and very little the age of this significant pipe organ in San Francisco. I hope those who do have such heritage in their neighborhoods don’t take it for granted, and I hope they aren’t prejudicial about “which bits” of heritage they choose to preserve. Certainly America has the resources to do better than simply say, “It’s not a big priority. Haul it off for scrap.” Populist America–not the world, but America–is in a “hate the organ” phase at present. In spite of this, there are significant new instruments being commissioned, as other posters have mentioned. The instrument survives despite the current popular climate. Everything ages: first popular, then worn, then out of fashion, then rejected. Then another generation comes along with fresh interest, sometimes excitement; restorations take place. If we destroy during the rejection phase, we deprive the future. Let’s hope that San Francisco, or even a few people with the means, will step up to the plate and rescue this substantial old Austin, both for its historical and musical value. Atlantic City is at last doing it with the Boardwalk Hall organ, a far more vast and expensive project because of its overwhelming size. San Francisco, it’s your turn. I live in a major capitol city in another part of the world where we have a very large concert pipe organ (150 ranks, seven of those at 32′ pitch) in our town hall which, like Opus 500 was originally built on a grand scale and to have the resources to play a wide variety of music. Having originally been built in 1929 it served the city well for decades and naturally with time, things needed attending to. That work was done at a cost of close to $5 million and that instrument is one of our major assets. You could not build an instrument on such a grand scale now, costs alone would prohibit that. Concerts are held on it regularly and even non-organ minded people have told me how much they love it’s sound. It is an instrument which has been and always will be an important part of our city’s heritage and culture. I hope that a suitable venue is found for Opus 500 so that not only the people of San Francisco can again hear this wonderful instrument but that it can be shared with the world. Yes, I’m an organist and value these instruments as I know something of what can be done musically with them. All credit to those who are involved with the project. You’re so correct John (comment Jan 20). There are so many more relevant endeavors to consider, like bank bailouts where a lot of the money went to the CEO’s and top tier bonuses and severance packages; nation building and WAR. What is more important than rebuilding two ungrateful nations on the opposite side of the planet, which, in 10 years time, will yet again stab us in the back, requiring us to invade once again…assuming this time we ever leave that region. You’re right. What good or relevant use is heritage and culture? When the majority of our youth are too stupid to understand the meaning of the term as they step off the curb into traffic with their nose and thumbs buried in their Smartphones. What relevance does it have? I tell you what. It’s for US, the people that have worked their butts off to make the world better. For US, those that do know the meaning of culture and heritage. Please elaborate what is more important? Welfare for illegal immigrants? The embarrassment called the Folsom Street Fair (I’m same-gender-attracted so I have the right to criticize). Ya know what? I’m kinda poor; but not so poor (or obscenely wealthy) that I get to avoid paying taxes. But a few million dollars to restore this historic treasure is a mere pittance in the budget of a city the size of SF. Yeah, that’s right. A few million is a drop in the bucket. It’s laughable in the grand scheme of infrastructure, services, etc that the city is responsible for providing. Where I live, there isn’t a single similar project that has come to be regretted. The only regret was the blindered, ignorant choices of the short-sighted, that left us with nothing more than hollows and dusty memories of what was once unique to us. Hoping that some philanthropic group/individuals can come through before the misanthropics have their misguided say. Pipe organs are dinosaurs. Ancient relics that once afforded the listeners an auditory delight. That was many, many, moons ago. Who actually cares about, or is interested in pipe organs anymore? It’s likely an esoteric fringe of organ lovers many of whom are of an advanced age that can “identify” with these egregious instruments. I’m positively baffled as to why anyone would want to spend hundreds of thousands, even millions of dollars to restore a pipe organ! It makes no sense especially when it’s state or city funds being wasted on rebuilding a pipe organ. There are fewer and fewer people who care about organs anymore, so the most relevant thing to do with pipe organs is to disassemble them and recycle all of the metal and wood. Surely something useful can be produced from all of those recycled organ components. The “Mechanics Hall Organ” you show is the 1864 E. and G.G. Hook Mechanics Hall Organ in Mechanics Hall in Worcester, MA. In 1982 full reconstruction was finished by Noack as Op. 92 and added to and retuned in 2003-2004 and who now maintains it. Hook built many organs in New England but Worcester’s is the largest with four manuals. See it at organweb.com/specs/mech-hall.html. Mechanics Hall is a beautifully restored “world class” venue with stunning acoustics. I know of only one other organ of its equal and that is the Boston Symphony Hall Organ at Methuen Memorial Hall in Andover, MA. Worcester did not give up on its “organ dream”, neither did Atlantic City and neither will San Francisco. 42 tonnes of love. What are your favorite kinds of music, who are your favorite artists, and what are some of your favorite songs and/or instrumental pieces? I am curious. This does have relevance to the topic at hand, which is this pipe organ, or at least the pipe organ in general. However, until I receive a response (it doesn’t have to be EVERYBODY you like, if you don’t want to list all of your favorites, just a couple of artists/musicians), I can’t give a more detailed reply. San Francisco is known Internationally for many things, at the top being the Panama Exposition of 1915. The Austin Pipe Organ was heard by thousands of people until the late 1980’s, and now sits in a basement awaiting restoration. I have heard many Pipe Organs around the Country, and wherever one remains, it is beloved by its’ Citizenry. Where could such an appreciation possibly exist other than in the City of San Francisco? The City lost its’ grand Fox Theater with its’ Mighty Wurlitzer Pipe Organ unfortunately, and now has a chance of redeeming itself by placing this Pipe Organ back where it was originally located in the Civic Auditorium. Money was allocated for the restoration, re-installment by FEMA at the time of the Earthquake, and that money mysteriously changed hands, along with seeming efforts by the City Officials to simply do nothing. Get Gavin Newsom, Diane Feinstein and Willie Brown on the Band Wagon to get this Pipe Organ playing again along with your current elected City Officials. Such an approach in saving the Panama Exposition Pipe Organ does not seem to be the San Francisco known by the World. Don’t disappoint the rest of us that visit the City by the Bay, and especially don’t deny your own citizen’s the joy of hearing the unique sounds of this Historic Instrument in a building with acoustics worthy of its’ presence. Remarkable article. I am also aware of the Pipe Organ that once played at the Oakland Fox Theatre which until a year ago was serving St. Peter’s Church also in Oakland. Certain members are currently looking for a new home for the organ. If you’re curious about “who actually cares about, or is interested in pipe organs anymore”, go attend one of the many organ recitals around the world. Here in San Francisco several hundred people come to the Legion of Honor every weekend on Sat/Sun to hear the organ recitals. Grace Cathedral hosted several hundred last Sunday. SF Symphony Hall is almost sold out for every organ concert. Have you ever been to St. Paul’s Cathedral in London for an organ recital, or the Spreckels Organ Pavilion in San Diego, or the Rockefeller Memorial Chapel in Chicago, or Meyerson Symphony Hall in Dallas, or the Wanamaker Organ in Philadelphia, or the Boston Symphony Hall Organ at Methuen Memorial Hall in Andover, MA? They host thousands of people. The American Guild of Organists (AGO) serves approximately 15,000 members in more than 300 chapters throughout the United States. The point of the article is that we have one of the most incredible organs anywhere in world sitting in storage right here in San Francisco, and it should be resurrected and played! A Yamaha keyboard plugged into a 1000 watt bass amp with 2×20″ subs will dwarf any pipe organ in sound. John and Michael: someday you will more than likely come to see the relevance. Ari Tarver: that would probably sound wonderful in the right acoustic environment. Then when you listen to a REAL organ in the proper space you will see its not the same. It’s not just loud we’re speaking of, but that the sound seems to come from every direction constantly changing. Why else are the makers of imitation organs spending big dollars trying to make them sound like the real thing. “ ” I often couldn’t distinguish between what was real and what had been a vivid nightmare.